"Global Institutions Under Threat : What Should Be Done About It?" Lord Hannay of Chiswick is a long serving British diplomat. He held various positions in the Foreign and Commonwealth Office in London since 1959. From 1984 until 1985, he was a Minister at the British Embassy in Washington, DC . He was then promoted to Ambassador and Permanent Representative to the European Economic Community a post he held from 1985 until 1990. From 1990 until 1995 he served as Ambassador and Permanent Representative to the United Nations. Between 1996 and 2003, he served as the Special Representative for Cyprus and in December 2004 was a member of the UN High Level Panel on Threats, Challenges and Change, reporting to the Secretary-General. 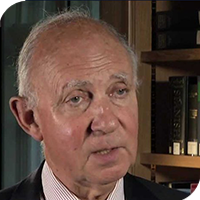 Lord Hannay was introduced to the House of Lords in 2001 and has been a member of the House of Lords International Relations Committee since 2015. He is also co-chair of the All‐Party Parliamentary Group on the United Nations at Westminster. From 2006 to 2011 he served as Chair of the Board of United Nations Association-UK. He is the Chair of the All Party Group on Global Security and Non-Proliferation and a member of the Top Level Group of UK Parliamentarians for Multilateral Nuclear Disarmament and Non-Proliferation.